Oh, Lancôme. Not only did you bring Génifique into my life ... now you’ve gone and introduced me to Génifique Youth Activating Eye Concentrate, too? How dare you overtake my entire skincare regimen? I say this in jest, of course. Génifique is, quite possibly, one of the best eye creams I’ve yet to come across. To begin with, the consistency is wonderful. It’s thick, rich and lush, yet somehow sinks into skin immediately without leaving behind any greasy residue. Only the tiniest amount is required for each eye –- really only a bit larger than a pinprick! –- and it completely covers the undereye area. And what this eye cream does, pray tell? Only diminishes fine lines and wrinkles, reduces dark circles, and makes the eye area look years younger in just a matter of days. Honestly, after only two weeks, I noticed a vast difference in the wrinkles (okay, smile lines) around my eyes. They really and truly began to disappear! Unbelievable. 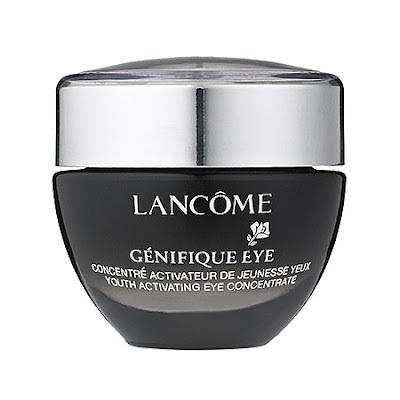 Lancôme Génifique Youth Activating Eye Concentrate retails for $62 at sephora.com.